Have you been wondering what that exquisite sound is buzzing in the air over here at Philip Morris? The low soft tune that has been weaving its way in and out of hot topics of conversation? Tired of guessing? Well, we’ll tell you! Can we have a drum roll please..? Roberts Radio began in 1932 and throughout the 80+ years, in which the fellow family-run business have been a popular name, they have edged their way into the limelight. It is very important to choose a radio that suits you and your lifestyle. A radio is not just an object that sits idly by on your mantelpiece, a radio expresses your very own individual style. Just like the music you listen to! The Revival Radio Range Has Arrived! 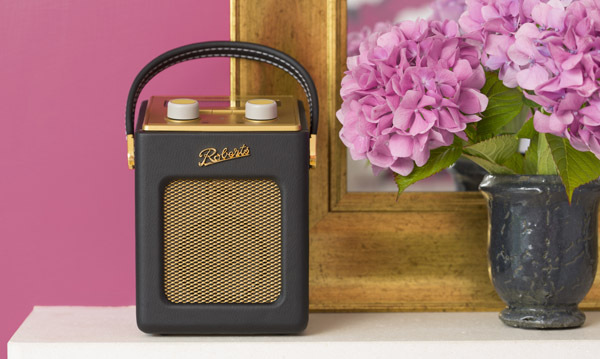 Let’s take a stroll back to the Fabulous Fifties… Introducing the Roberts Radio Revival DAB Radio! This particular range has been styled around the classic 1950’s era with bold, yet sleek, attributes. Featuring gold plated attire that defines a Roberts Radio’s prestigous characteristics. The radios come fixed with a golden embellishment of the iconic “Roberts” name. As we all know the 1950’s were all about colour and innovation, so if you are looking to add a splash of colour to your home, then this range is perfect for you. We like to consider this as the chameleon of the family, as it comes in a total of 13 different colours, which will compliment any environment. With up to 120 hours of battery life and a strong, easy to carry handle, you can now enjoy listening to an array of broadcasts whilst on the go! Or, for a more acquired taste, why not connect your iPod or MP3. 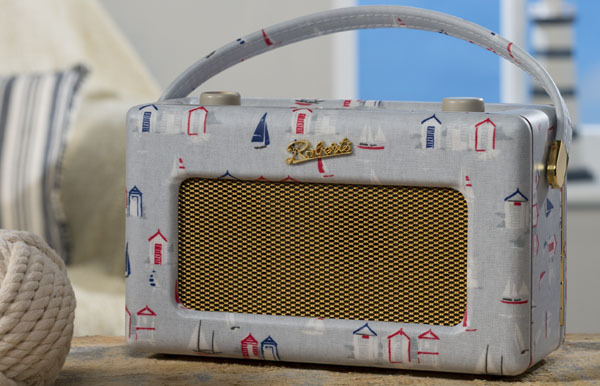 This year Roberts Radio have joined forces once again with fabric designers Clarke and Clarke to create unique Limited Print additions to their Revival Range. Longing for a coastal break, but can’t get away from the office? Well, with the Roberts Beach Huts themed radio, why not bring the seaside to you? This model makes a perfect component to bring back that summer feeling. 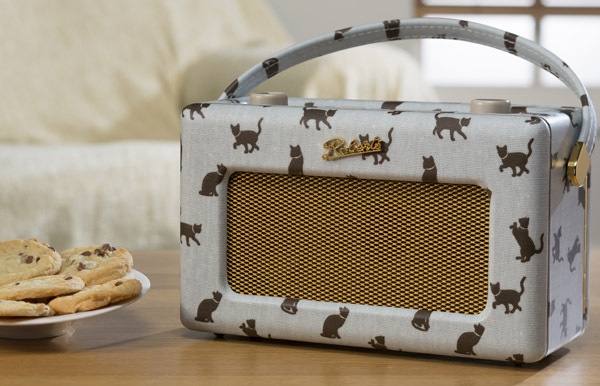 Or, if you are an animal lover, and are looking to show our feline friends some appreciation, then get your paws on the Roberts Kitty themed radio here. Celebrating the Nation’s iconic Union Jack Flag, Roberts Radio have created this dazzling, patriotic print to fill our homes with the love of Great Britain. 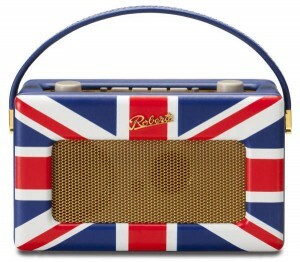 There are only a select amount of the Roberts Union Jack Radio available in production, so don’t miss out! The Mini DAB Revival Radio may only measure 180mm in height, 145mm in width, and 1.1kg in weight, but the Mini is as every bit of a show stopper as it’s older sibling, and within its own right too! Due to the Mini’s compact size, you can easily pop it inside your picnic bag and indulge in a lazy afternoon. This model includes 4 batteries, but you can also purchase rechargeable batteries, which you can then charge in the built in battery charger. Bring the 1950’s and 21st Century together with the iStream 2 Internet Radio. You can connect the iStream to your computer, which will allow you to stream music from your PC and from your Spotify account (make sure you have a Wi-Fi connection to do this). The Roberts iStream 2 has 30 pre-set stations and allows you to connect your USB devices. So, if you’re having a Lazy Sunday and just can’t bare to move from your all too comfy sofa (It’s ok, we all have days like these! ), with the iStream 2 you can download the ConnectR app on your Android or iOS phone, which will allow you to control your radio from your cosy nesting place, so no need to get up! If you are intrigued by the wireless aspect of the Roberts Radio, then take a look at the Roberts Radio Revival Blutune DAB Radio. The Revival Blutune radio is unlike all the other radios, with its silky smooth black chrome vesture, and silver plated “Roberts” script. The Blutune allows you to stream music from your iPhone or android devices using a Bluetooth connection. This radio features a blue back-light display and an easy to read 16 X 2 character LCD display screen. If you liked the 1950’s inspired Revival range, you may also be interested in the special edition Sovereign Radio. 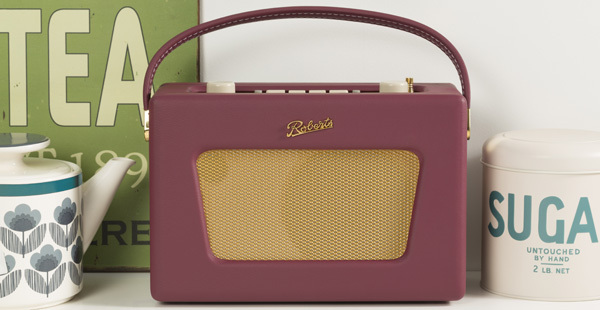 Moving a decade ahead with a 1960’s feel, Roberts Radio has created the Sovereign especially to honour the Queens Coronation. For those who like to listen to the finer details within the music, the Sovereign will be perfect for you as it’s modified with a large sound speaker to optimise the quality of sound. Featuring a built in bass and treble control station, you can now alter the music levels to your specifications to fulfil your musical needs. If you haven’t found a radio that speaks your volume, then take a sneaky peak at our full range of portable Roberts Radios. I have been the Manager of the Hardware and Toy department at Philip Morris and Son for many years now. Follow my posts for all the latest product information and care guides. Blutune Bluetooth DAB Radio, Electronic Appliances, iStream 2 Iternet Radio, Portable Radio, Revival mini DAB Radio, Revival Range, Roberts Radio, Sovereign DAB Radio. Bookmark.